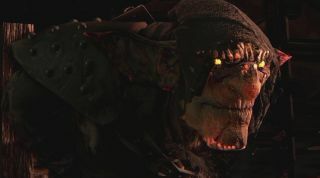 Styx: Master of Shadows, a third-person stealth game starring a grumpy goblin with a taste for creative murder, was actually pretty good. It earned a solid 78 in our October review, which said it "weaves an entertaining Grimm-like yarn in and around twenty hours worth of furtive fun." With any luck, the next one will be even better—and yes, there will be another. Word of the sequel came by way of a very brief, silly teaser, in which the eponymous assassin expresses the true depth of his holiday spirit. "Styx will be back in a new adventure, without his Santa hat," it concludes. "Stay tuned!" And that's it. Not the most thoroughly-detailed game announcement of all time, perhaps, but definitely good news for Styx fans.